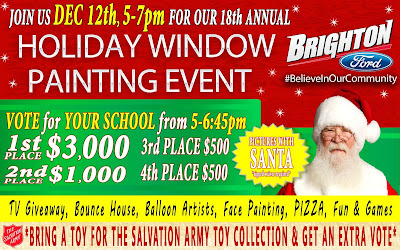 For 18 years we have been inviting Brighton Area Elementary Schools to paint our showroom windows for the holidays. This is just one, of the many community events Brighton Ford participates in to help our community. We give the opportunity for the elementary school students of Brighton to express themselves artistically with paint and decorate our showroom windows for the holidays. We also will donate thousands of dollars to the Brighton Area School's art departments, as we understand the importance of art and creative thinking for our young students. This year's 18th Annual Holiday Window Painting Contest main event will be held on December 12th from 5-7pm. This is a free community event that is fun for all ages, where participants can vote on the best school's window art. Voting on the student's window art is from 5-6:45pm and you can earn an extra vote if you bring a toy for the Salvation Army Toy Collection (one extra vote per person). There will be pictures with Santa, a flat screen TV giveaway, bounce houses, balloon artists, face painting, PIZZA, fun and games for all. Bring your family out for this awesome free event on December 12th!